The nutritional needs of a puppy are different from that of an adult or senior dog. For instance, an energetic puppy requires more calories per day than a sedentary senior dog. You should also consider your dog’s lifestyle and activity level. Does she or he hit the trails every day? Or is she or he more of a Netflix-chillin’ couch potato? Also, is your dog at a healthy weight? Many brands have formulas targeted at your specific needs such as healthy weight, small breeds, large breeds, adult formulas or puppy plus formula. The Association of American Feed Control Officials (AAFCO) offers a stamp of approval, which is posted on approved pet food. This stamp reflects that the product meets the minimum nutritional requirements your dog needs for a complete and balanced diet. Dog foods are generally marked with one of two AAFCO labels: “all life stages” or “adult maintenance.” All life stages are formulated to meet requirements for a growing puppy (or a lactating dog), while adult maintenance foods are targeted at healthy adult dogs. Dogs are omnivores, eating meat, grain and vegetables. On a label, the ingredients are listed in the order of predominance by weight. A dog’s ideal source of protein is meat. Therefore, you want to ensure that the first ingredient listed is a protein, such as chicken, beef or lamb. For instance, seeing the word “chicken” on the ingredient label means that the meat is primarily of muscle tissue. A “meat-by-product,” on the other hand, is the non-rendered parts of an animal, including the lungs, kidneys, brain, blood, bone and more. “Meat meal” describes any rendered product from animal tissues. 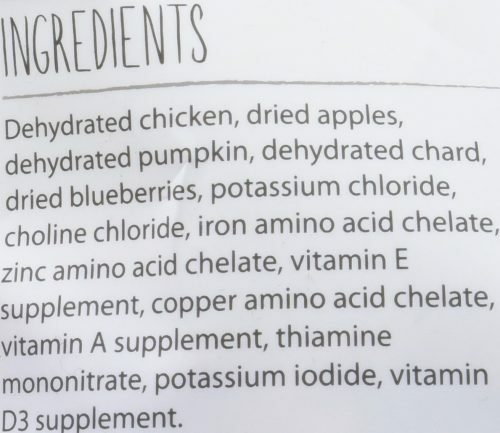 Therefore, avoid feeding your dog foods that contain “meat-by-products” and “meat meal.” Also, the first ingredient listed should not be from a vegetarian protein source (soy), grain, tuber or vegetable. Avoid harmful preservatives, artificial colors and stabilizers, such as high fructose corn syrup, Yellow #, benzoyl peroxide (used to bleach flours and cheese), butylated hydroxyanisole (BHA), butylated hydroxytoluene (BHT) and ethoxyquin (synthetic preservatives used to increase the shelf life of food). Note that manufacturers must list the preservatives they add, but they do not always list preservatives in ingredients such as fish meal or chicken meal, which may be processed elsewhere. Refer to our blog post, AAFCO Pet Food Labeling Guide, for more detailed information on reading an ingredient list. 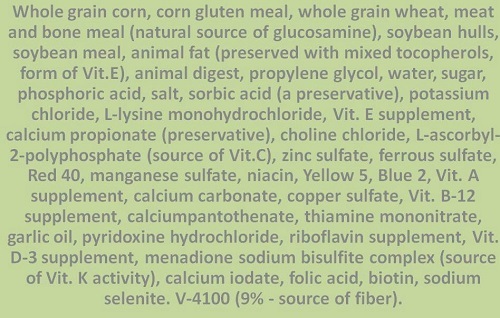 The first formula below lists corn and wheat as the initial ingredients, followed by meat and bone meal with many processed chemicals and preservatives. This food is not the healthiest choice to feed your doggy. 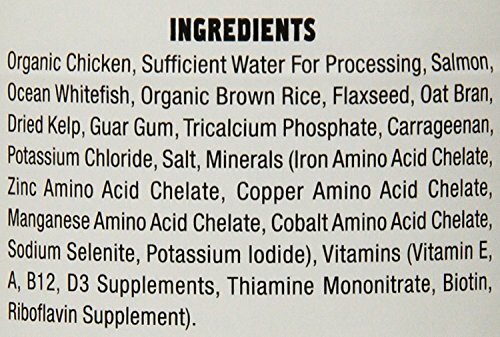 On the other hand, these labels list chicken as the main ingredient, followed by recognizable whole food ingredients and supplements. These are much healthier options to feed your doggy. The most common food allergens are beef, chicken, lamb, fish, dairy, eggs, corn, wheat and soy. Common signs of allergies include the following: itchy, red, moist or scabbed skin, increased scratching, itchiness, runny eyes, itchy ears and ear infections, sneezing and gastrointestinal (GI) problems (vomiting, diarrhea and constipation). If you suspect that your pup has an allergy, speak with your veterinarian as their food may be the culprit. While grains are not inherently bad for your dog, too high a content can lead to obesity and disease. 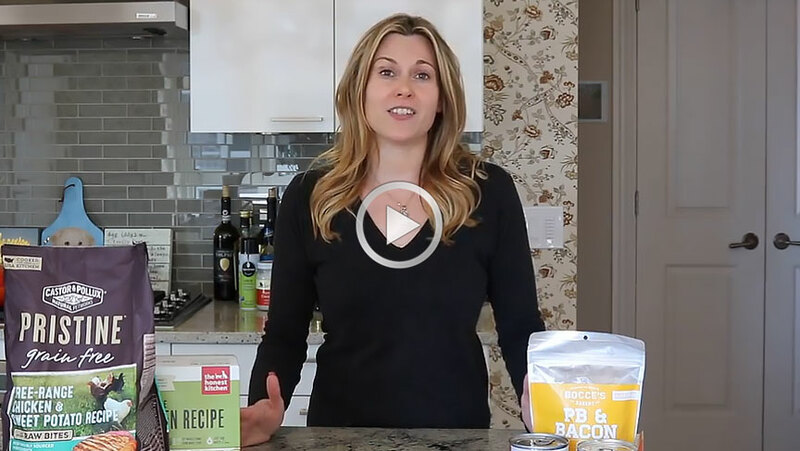 Choose brands and formulas that have a higher protein content and are corn and wheat free. These are ingredients often used as fillers with no nutritional value. Grains such as brown rice, quinoa, barley, millet and oats are healthier options. Water is the most important component to maintaining your dog’s optimal body function. Therefore, when choosing between a dry and canned food, take this into account. Canned foods are around 75 percent moisture, while dry foods contain only 6-10 percent moisture. Thus, if your dog’s diet consists of primarily dry food, he will need more water to stay healthy and hydrated. Regardless, always have a fresh bowl of water available for your pup throughout the day. Keep dog food stored properly. Be sure to check a food’s “best by” date on the label before buying or feeding it to your dog. Dry food should be stored in the original bag in an airtight container (BPA-free plastic or metal) in a cool and dark place, like a closet, pantry or freezer. It is best to use opened dry food within 6 weeks of opening. In addition, for added freshness, consider buying smaller bags so they are used up faster. Unopened canned food should be stored in a cool, dry place, while leftover canned food should be covered in the refrigerator. Many small companies, like The Honest Kitchen and The Farmer’s Dog, are creating whole food meals in freeze-dried or dehydrated varieties, as well as fresh and frozen whole food meals. You can also cook healthy recipes for your dog. You can get healthy dog recipes from my blog. Check the ingredient list in your dog’s food brand and treats. If there are some good brands that you feed to your doggy, share it on our private Facebook group. Join our private Facebook group to discuss everything dog-related. Click here to request access.